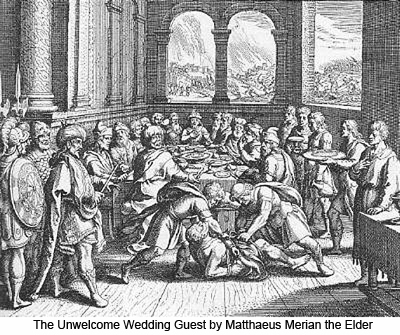 “The kingdom of heaven may be likened to a certain king who made a marriage feast for his son and dispatched messengers to call those who had previously been invited to the feast to come, saying, `Everything is ready for the marriage supper at the king’s palace.’ Now, many of those who had once promised to attend, at this time refused to come. When the king heard of these rejections of his invitation, he sent other servants and messengers, saying: `Tell all those who were bidden, to come, for, behold, my dinner is ready. My oxen and my fatlings are killed, and all is in readiness for the celebration of the forthcoming marriage of my son.’ But again did the thoughtless make light of this call of their king, and they went their ways, one to the farm, another to the pottery, and others to their merchandise. Still others were not content thus to slight the king’s call, but in open rebellion they laid hands on the king’s messengers and shamefully mistreated them, even killing some of them. And when the king perceived that his chosen guests, even those who had accepted his preliminary invitation and had promised to attend the wedding feast, had finally rejected his call and in rebellion had assaulted and slain his chosen messengers, he was exceedingly wroth. And then this insulted king ordered out his armies and the armies of his allies and instructed them to destroy these rebellious murderers and to burn down their city. After speaking this parable, Jesus was about to dismiss the multitude when a sympathetic believer, making his way through the crowds toward him, asked: “But, Master, how shall we know about these things? how shall we be ready for the king’s invitation? what sign will you give us whereby we shall know that you are the Son of God?” And when the Master heard this, he said, “Only one sign shall be given you.” And then, pointing to his own body, he continued, “Destroy this temple, and in three days I will raise it up.”But they did not understand him, and as they dispersed, they talked among themselves, saying, “Almost fifty years has this temple been in building, and yet he says he will destroy it and raise it up in three days.” Even his own apostles did not comprehend the significance of this utterance, but subsequently, after his resurrection, they recalled what he had said.